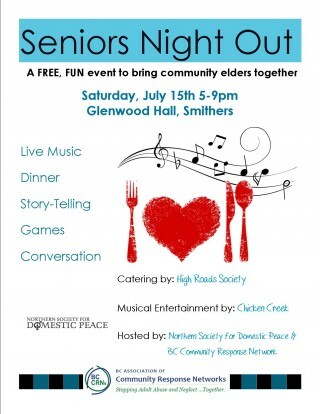 On July 15th all local seniors are invited to Glenwood (Driftwood) Hall for another fun-filled Senior's Night Out. Once again we will be offering a lovely, free catered dinner, games and live music by Chicken Creek! Event starts at 5:00pm and runs until 10:00pm. We don't want to see anyone left out so if you need help with transportation please give NSDP a call (250-847-9000) and we will try to arrange a ride for you.